The Thematic Institute will bring together 50-75 researchers and young scientists with broad international representation in geochemistry, experimental petrology, volcanology, geodynamics, thermodynamics, geophysics, paleoclimate and geology. The goal of this Thematic Institute is to integrate efforts between communities studying the forms and fluxes of carbon in Earth in order to address the long-term fate of carbon on the planet. We hope this effort will lead to a model for fluxes and uncertainties that addresses one of DCO’s decadal goals: "Is the net flux of carbon into or out of Earth?" If carbon is disappearing into Earth via plate subduction, does this affect the surface abundances over geological time? Or is carbon returned efficiently to surface pools via metamorphism, migration, magmatism and eruption? This 3-day workshop at UC Berkeley will bring together 50-75 researchers and young scientists with broad international representation in geochemistry, experimental petrology, volcanology, geodynamics, thermodynamics, geophysics, paleoclimate and geology. This DCO Thematic Institute (July 1-3, 2015) overlaps with the CIDER Summer Program (Cooperative Institute for Dynamic Earth Research), which will be held in Berkeley, CA from June 30 - July 31, 2015. The CIDER theme for 2015 is "Solid Earth Dynamics and Climate - Mantle Interactions with the Hydrosphere & Carbosphere." Applications to both the DCO Thematic Institute and the CIDER Summer School are welcomed. Lodging (double occupancy campus apartments), meals, and partial travel support will be provided for successful applicants and invitees. Further lodging and travel details will be sent to accepted applicants. All applicants must be members of the DCO Science Network. For details, see the DCO Science Network web page. Saturday, 28 February 2015. Applicants will be notified of acceptance in March 2015. Scientific Motivation: Carbon is removed from the atmosphere and biosphere via rock weathering reactions, carbonate precipitation, and settling of fossil shells and organic matter onto the seafloor to form marine sediments. 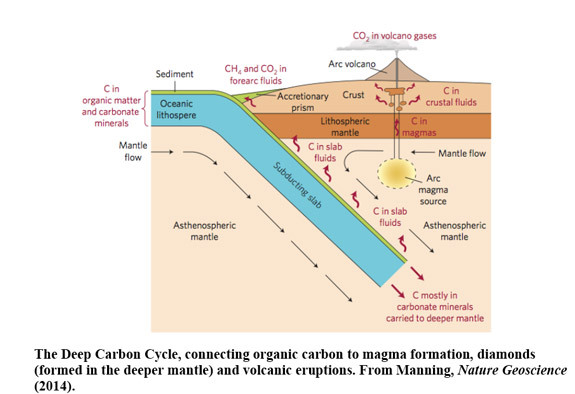 While the fate of terrestrial carbon involves cycling between the atmosphere, biosphere and lithosphere (with by far the largest reservoir being continental limestone sediments), the fate of marine carbon on the deep seafloor is subduction into Earth's mantle. Subjected to high pressures and temperatures in the subduction zone, this carbon may ultimately form diamonds, or fluids and melts that migrate upward, eventually erupting out of volcanoes into the atmosphere. Some carbon fluxes to the atmosphere, however, are part of the planet's primary budget, and so another important question is how much carbon output is part of the planet's continuous outgassing and how much is recycled from Earth's surface. The budgets of inputs (via weathering, burial, and subduction into deep Earth) and outputs (via volcanism, diffuse and focused CO2 emission into the atmosphere and ocean) are as yet so poorly known that we do not yet know whether the sign of net flux is positive or negative (i.e., net planetary ingassing or outgassing). There have been attempts to quantify fluxes of seafloor carbonate into subduction zones, the emission of CO2 from volcanoes, and the balance of different Earth reservoirs, but there is as yet no consensus on the sizes of each reservoir, the fluxes between reservoirs, nor even the theory of how and when carbon transforms from solid to fluid to gaseous phases. This DCO Thematic Institute will explore these processes and fluxes in a three-day meeting. DCO has selected two early career scientists as recipients of the 2018 Emerging Leader Awards.